Although we attempt to keep the status of the trails updated for your convenience, sometimes closures happen quickly for safety concerns, and may not be updated on this page. When you come upon barricades, please obey the detours. This can be an inconvenience but they are in place for your safety. Always be aware of the possibility of high water along the river and use caution when traveling along the trail at underpasses. Please Note: For a map of trail closures please visit the NoCo Trail Report. 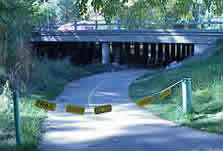 Posted 9/4: The Poudre Trail will be closed to trail users between College Avenue and Linden Street starting Sept 6th 2018 thru September 2019 for work related to the construction of Whitewater Park. Trail users will be detoured along College Avenue and Willow St. during this timeframe. Posted 4/1/2019: The Spring Creek Trail will be closed from Michener Drive to Featherstar Way through mid-April relating to sanitary line installation. The trail closure end date is not determined at this point, but will be updated as work progresses. Thank you for your patience during this prolonged detour, there have been several challenges faced during this utility work, and we understand the frustration that this trail closure causes. Posted 3/29/2019: The Spring Creek Trail closure is extended until Friday, April 29. Posted 3/25/2019: The Spring Creek Trail closure is extended until Friday, March 29. Posted 3/18/2019: The Spring Creek Trail closure is extended until Monday, March 25. Additionally, please use caution on the detour route as there are icy patches due to snow melt. Posted 3/12/2019: The Spring Creek Trail will be closed from Michener Drive to Featherstar Way starting Tuesday, March 12th thru Monday, March 18th for utility installation and construction. Trail users will be detoured with signage around the construction zone along Moore Lane and Drake Road. Posted 2/28/2019: The Spring Creek Trail will be closed at Riverside Avenue for utility work related to stream restoration and trail modification along the Spring Creek starting February 2019 through Spring 2019. Trail users will be detoured with signage along temporary, soft based trails in the area, as well as through Edora Park. Posted 6/19/2018: The Riverside Avenue bridge underpass along the Spring Creek Trail will be closed to trail users from September 2018 thru June 2019 for construction related to the Riverside Bridge replacement. Trail users will be detoured around the construction utilizing an at-street grade crossing. Looking for a Parks Trail Map? For mor information, please visit our bicycling website. To report problems along the trail system, contact Parks main office at 970-221-6660 or email cGFya3Nob3BAZmNnb3YuY29t.